Home / Parenting / Primary School / When the kids start school, what’s next for mums? When the kids start school, what’s next for mums? Kids aren’t the only ones affected by a new routine when a new school journey begins. Mums can also have a hard time adjusting to the new environment, responsibilities and expectations that come with having children at school. 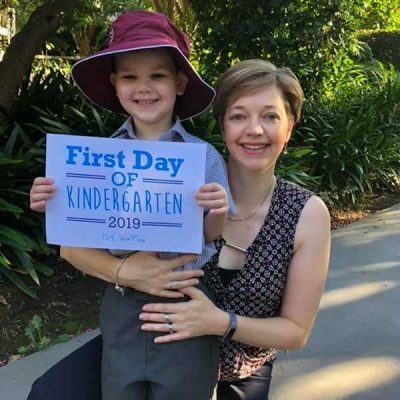 Clinical psychologist Louise Remond from The Kidman Centre UTS, explores what having a child at school can mean for mums and families, and how best to tackle the initial transitional time with minimal stress and maximum support. What are some the biggest misconceptions about having a child start school? It’s easy to think that it’ll lighten the household load but that isn’t always the case, is it? With most life phases there are potential upsides and downsides – having a child start school is no exception. For many parents, the predictability provided by their child being in the care of the education system six or so hours a day, five days a week during term time, can help provide a sense of routine and structure. For some, it may feel liberating and offers a welcome taste of a process of growing independence both for them and their child. On the flip-side, school life brings with it a whole gamut of logistical, practical and emotional demands which many parents may not have been faced with before. The school-related ‘to do’ list can seem endless: lunches sorted, uniform ready, bags packed, the daily search for the lost shoe, organising before-school care, making it to class before the bell goes; remembering which day is sport/library/topic talk; staying on top of homework/ readers/spelling lists and all that is just before you walk out the door in the morning. Add that to the logistics of juggling parents’ work schedules, other children and extracurricular activities and it’s little wonder that it can all feel overwhelming at times. Aside from the practical challenges, there are the emotional curveballs which can be thrown your way at any time. These can range from trying to manage an exhausted child unravelling after just holding it together all day in class, to negotiating the inevitable playground politics. 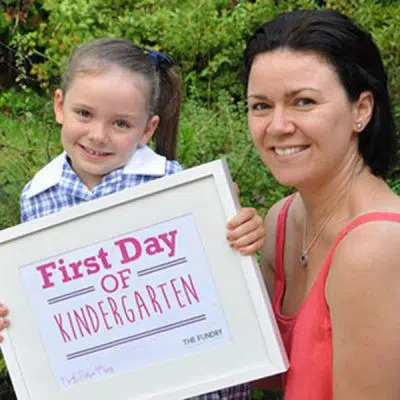 Having a child start school is a big emotional shift for everyone involved, how do you suggest mums deal with the anxiety that comes with such a structured and routine new way of life? Adjusting to change takes time. Once the nerves, excitement and/or trepidation of the first few weeks passes, often the day-to-day reality of school life kicks in. For most parents and children school and all it encompasses is going to be a significant part life for 13 or so years. Accept that there are going to be highs and lows and that it is not always going to be easy. Reassure yourself and your child that while there are bound to be challenges at times, you will find ways to manage these when they arise. Most new routines require a lot of conscious effort at first (think back to the information overload that typically comes with starting a new job or caring for a newborn in the first few weeks). Give yourself space to find your feet. Over time the daily ‘what needs to be done’ of school life will hopefully become more automatic and ingrained. Eventually, it will just part of what you do. Having kids at school often means more organisation and emotional support is needed in the home to accommodate the hours and structure, how do you think families can tackle this when things such as work come into play? When increased demands are placed on our time and headspace, often it can feel overwhelming. It can be easy to fall into the trap of thinking “it is all too much” and trying to bury your head in the sand. However, it is the times when it all seems bigger than Ben Hur that taking effective action is needed most. Instead of becoming overawed by the seeming enormity of what is required, break it down. Ask yourself: “What specifically do I need to do here?” Work out the particular areas you need to organise (eg. lunches, uniform, homework). Next, generate a plan for how to tackle each of these. For example, if the idea of managing school drop off and pickups on the days you are working has got your stress levels peaking, set yourself some steps for addressing this (eg. talk to my boss about flexible working hours; ring up and ask about after-school care; discuss doing an afternoon ‘child swap’ with a friend once a week). Taking constructive action to try and solve a problem can help you feel more in control. Also, be flexible and open to other options. If the morning routine is going haywire resulting in stress across the household, get your creative problem-solving hat on and explore other ways of doing it (eg. getting your child to lay their uniform out the night before). Don’t fall into the trap of trying to be ‘superwoman’ and doing it all on your own… partners, children, family, outside help can all have roles to play. Be realistic about what you can manage and factor in your own ‘recharge’ time as well. The schoolyard landscape has changed significantly over the years and now includes a lot more social interaction between families – this can often cause anxiety for time-poor, working parents. How can we remain involved without over-committing and causing more stress to our lives? In the first few weeks of school, there is often a flurry of playdate planning and organising of catch ups. These can be a helpful way to get to know the people behind the class lists and faces. They can also provide children with an opportunity to bond beyond the school gates. However, sometimes the playdate phenomenon can also feed into parent anxiety and guilt. It can be easy to fall into the trap of thinking that if my child misses out it could be socially disastrous and worrying they may be left out or not make friends. Take a step back and turn the pressure down. Ask yourself: “What is realistic for me and my family?”. There are many other things to juggle besides your child’s social calendar, so aim to keep the balance. Pick and choose catch ups that are manageable for you. If you only have one free afternoon a week, perhaps take the initiative and suggest a catch up at a local park for those from the class who can make it. Don’t forget your child is interacting with others all day at school – there is always lunch and recess to play together. For children, having some downtime and the opportunity to just be in their own company is important too. We often focus on children struggling to adjust to school, but at the same time, mothers can also find the entire process isolating, daunting and overwhelming. Are there any strategies mums can put in place to make the adjustment a positive experience? Children are not the only ones who may be starting their school journey wondering: Will I fit in? How will I make friends? What is it going to be like? Uncertainty and nerves are a natural reaction to any new situation, even for adults. If you are feeling a sense of apprehension, balance your concerns by reminding yourself of some of the potential positives (eg. “this could be an opportunity to meet different people I might click with and to become part of a community”). Encourage yourself to put yourself out there a bit. If you are on the shyer side it may be a case of being prepared to push yourself out of your comfort zone at times. A simple smile and ‘hi’ can go a long way. Make the most of casual opportunities to strike up conversations with other parents (eg. when you are all waiting outside the classroom at pick up). Remember, you have the advantage of a common denominator (children at the same school) so this can be your starting point for interactions (eg. asking “how are you finding it all?”). If connecting with others in the school community is something you value, perhaps look at getting involved in aspects of the school which you find interesting and worthwhile (eg. attending evening P&C meetings; helping out with reading groups). What would be your top tips on how mums can navigate the early school years without losing their minds with endless meetings, play dates, lunchbox prep and general organisation? Endeavour to get a workable daily and weekly routine in place for you and your family. Identify what needs to be done and make a plan. Challenge any unrealistic expectations you may have of yourself or your child. Often we put immense pressure on ourselves and others by holding rigid and unrealistic standards. These typically take the form of ‘shoulds’ and ‘musts’. For example, “to be a good mum I should send my child to school with a perfectly nutritious, balanced lunch every day”… “I must never miss a carnival/concert/presentation”… “I should be involved in every aspect of school life”… “I should always be on top of everything at work/on the home front/in relation to my child’s school work”. While many of these may be something to aim towards, take the pressure off by changing them preferences (eg. “I would prefer to.”. or “I would like to…. but it is not always possible”). Remind yourself that even when these things don’t happen, you are still alright and life will be OK.
Recognise that everyone needs a time out from the routine at some point. In amongst the ‘to-do’ lists, find opportunities for the family to connect, have fun, play, chat and chill. Keep it all in perspective: While at times it may feel like the consequences of a lunch box left at home, a forgotten mufti day or a book week costume gone wrong are potentially catastrophic, in the grand scheme remember that they are rarely a disaster. Life doesn’t always go smoothly, things are not always perfect, and sometimes we all make mistakes. This is how we (and our children) learn important lessons such as resilience and problem-solving. Where do you suggest mums and families turn to if they are struggling with the everyday hurdles that having kids at school brings? Stress and struggles are an inevitable part of life. Hopefully, we can mostly ride the waves and with time, come out the other side. Sometimes, however, we can get stuck. We may feel overwhelmed and find it hard to come up for air. Different people have different thresholds, but if you are finding it all too much or feel like you aren’t coping, speak up and reach out. Sometimes opening up and talking things over with a trusted friend or relative may be all it takes. They may be able to offer support, a different perspective or fresh ideas for how to deal with the situation. If this isn’t enough, free and confidential online and phone counselling options are available. Parent lines are offered in each state. To find the best one for you to access try Kids Helpline. You could also talk it over with your GP who may refer you to a counsellor or psychologist or counsellor who can help you work through the challenges you are facing. Louise Remond is a Clinical Psychologist at The Kidman Centre UTS, with an interest in mental health and wellbeing. For many years she responded to questions in DOLLY magazine’s Dolly Doctor: Love and Life column and recently co-authored a book: Good Thinking: A teenagers’ guide to managing stress and emotions using CBT. Louise is mum to two ‘busy’ and ‘spirited’ boys and is intrigued by the roller coaster ride that is life. This article was originally published on The Grace Tales. This is a great article, full of truths and tips. I would love to hear your ideas on getting back into the work force! How to navigate the the terrible school hours verses working hours and how to manage children who are struggling settling into school and want parents at every event, class activity, drop off and pick up!